This cozy holiday home lies together with 4 other holiday homes on a spacious estate. The properties are divided over 3 buildings and are tastefully and cosily decorated. Together with the other residents you'll have access to a large garden with large swimming pool, a spacious terras, a washing machine and a playground. From the garden you'll have a magnificent and panoramic view of the gorgeous surroundings. The estate is located in the small village of Tozzetto. 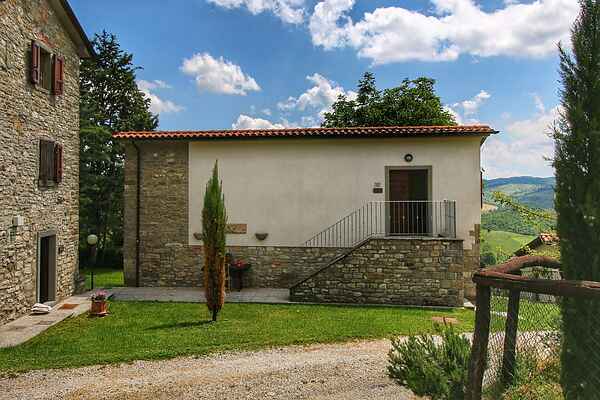 Despite being tucked away in the typical Tuscan rolling landscape, the house is located at a very central location. You can do your daily shopping at Caprese Michelangelo only 2 km away. This is also where the Michelangelo's childhood home is located. Also, at 4 kilometers you'll find the beautiful artificial lake of Montedoglio. Perfect for a quick swim. There are also many activities for culture enthusiasts. At a distance of 8 km lies the medieval town of Anghiari. And at a distance of 16 km lies Sansepolcro, where the famous renaissance painter Piero della Francesca was born. You can admire his masterpieces in the local museum. You can admire one of his most famous frescos in Montechi (12 km).